Councilwoman Georgette Gomez is spearheading an effort to create an inventory of the soon-to-expire affordable housing in the city. Advocates have been pushing the idea, too. But some city leaders say a list wouldn’t be very useful, and that instead focus should be on acquiring funding to build new affordable housing projects. Affordable housing advocates think they’ve got a way to combat San Diego’s affordable housing shortage: keep track of the city’s affordable housing. Councilwoman Georgette Gomez is spearheading an effort to create an inventory of the soon-to-expire affordable housing in the city. Once the database is made, she said city leaders will be better positioned to preserve the developments, holding down rents there even after the government contracts requiring price controls expire. Fellow advocates have been pushing the idea, too. But some city leaders say a list wouldn’t be very useful, and focus should be on acquiring funding to build new affordable housing projects instead. Over 1,300 federally subsidized homes in the city of San Diego were lost from 1995 to 2016 due to expiring government contracts, according to data from the California Housing Partnership, a state agency created to help preserve California’s existing affordable housing supply. It’s a process that recently played out at an affordable housing project in Rancho Peñasquitos. Penasquitos Village units were restricted to low-income residents, but the restriction expired in 2010. By 2016, developers proposed razing the building and replacing it with a market-rate project with far fewer units restricted to low-income residents. The loss of that affordable housing project spurred Gomez and others. Creating a running list of units facing expiration became a priority. Some lists like this already exist. The San Diego Housing Commission has a list of nearly 35 housing developments at risk of converting from affordable to market-rate rents through 2020. LISC San Diego, a nonprofit that provides affordable housing and economic development support, has a list of more than 40 projects that have expired or soon-to-expire affordability requirements. And the California Housing Partnership has a list of nine properties with federal- and state-assisted rental housing requirements that will expire in the next five years. None of the lists, though, include all of the at-risk affordable units in the city. The outliers include affordable units created through deals with the city’s former redevelopment agency and other units created via one-off contracts between the city and developers. “There’s no comprehensive list, that’s the problem,” Gomez said. 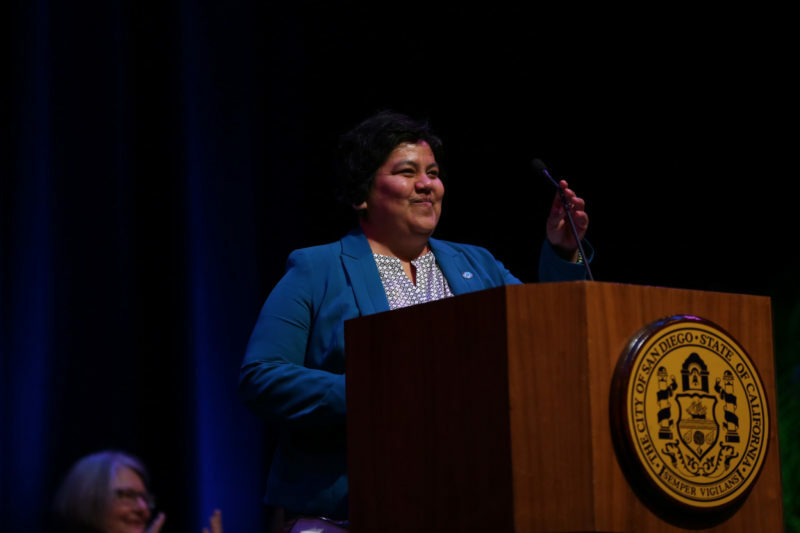 Gomez, who chairs the city’s smart growth and land use committee, said she wants all of the city’s at-risk affordable units in one searchable database that the city and affordable housing developers can easily access. The San Diego Housing Commission will build the list. The public agency is also hiring a housing preservation coordinator who will use the information in the new database to create action plans for each project. The new staffer is expected to be hired soon, but the list won’t be released until the end of 2019. But Ricardo Flores, executive director of LISC, said even if the database was built and ready to use today, there wouldn’t be much the city or the Housing Commission could do with it. Property owners who might consider opting out of affordability requirements would need to be presented with financial incentives to remain affordable or a competitive real estate offer. “In reality, there’s nothing anyone can do about these expired projects, unless they have money,” Flores said. There are several housing projects in San Diego, for instance, with affordability contracts that have already expired in the past few years, according to both LISC and the Housing Commission’s lists of at-risk affordable developments. Those property owners haven’t yet raised prices, or sold or redeveloped the property, but they could at any time. Nonetheless, Flores said the list could be used to illustrate to city leaders the need for more affordable housing funding. He said LISC is working to add to its own list and attempt to build a more comprehensive inventory in the next few weeks – well ahead of the Housing Commission’s 2019 deadline. He said he wants to get the list done before the City Council vote on whether to put a $900 million affordable housing bond measure on the November ballot. The vote has yet to be scheduled, but the deadline to put measures on the ballot is Aug. 10. Flores and other affordable housing advocates say the bond could bankroll an estimated 7,500 homes for homeless and low-income San Diegans.